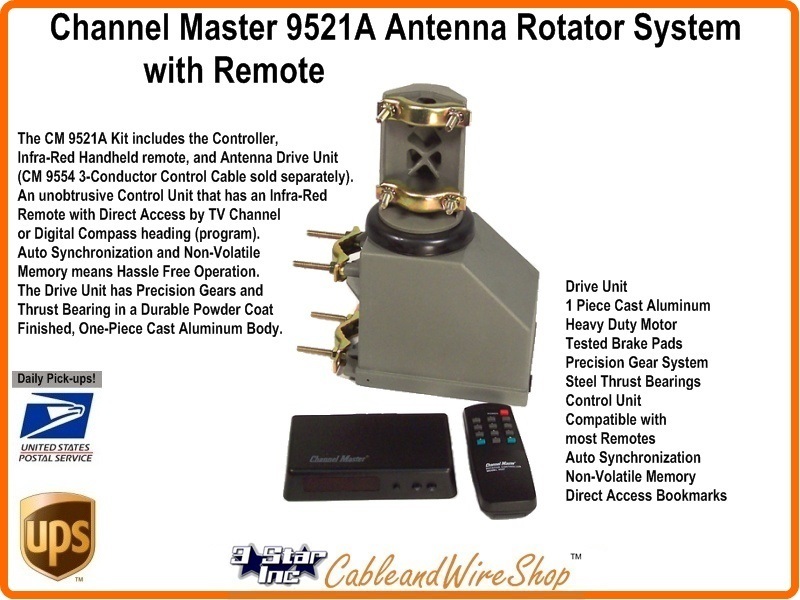 The CM 9521A Kit includes the Controller, Infra-Red Handheld remote, and Antenna Drive Unit (CM 9554 3-Conductor Control Cable sold separately). An unobtrusive Control Unit that has an Infra-Red Remote with Direct Access by TV Channel or Digital Compass heading (program). Auto Synchronization and Non-Volatile Memory means Hassle Free Operation. The Drive Unit has Precisiongears and Thrust Bearing in a Durable Powder Coat Finished, One-Piece Cast Aluminum Body. Note: These Rotors are New Stock and were Manufactured AftER the time when a former supplier to Channel Master Substituted parts within the Rotor which led to Errors in Direction Readings or not rotating past a certain point to North! These Mounts and Masts come in Standard sizes for Interoperability with the Antenna you may select, and Options are available in Sizing for Specific Aplications... Most Antennas will Operate Perfectly with any Mast and Mounting Scenario as long as the Physical Installation is Sound. A Variety of Weather-Proofing and Hardware is Available here at 3StarInc.com to Guarantee You have what you need for Industrial Grade, Professional Quality Installation with the very same Brand Name Products that are Industry Standards.